The Golden Gate Bridge is perhaps San Francisco’s best known landmark; it attracts many tourists to our region. However, for many others, the bridge is simply a part of everyday life and their daily commute. Sadly, the bridge has seen a number of accidents over the years. Bridge accidents are particularly frightening and our San Francisco accident law firm believes that discussions about improving bridge safety should be a regular part of the local dialogue. Our community should demand safe structures on our roads and community members should also do their part to ensure the safety of Northern California’s roads. On Thursday September 19, according to a news report on the official website for the Golden Gate Bridge, a committee including 11 out of 19 members of the span’s Board of Directors voted unanimously to move forward with a plan to purchase and install a Moveable Median Barrier (“MMB”). The full board is expected to confirm this vote. Currently, the MMB is expected to cost $26.5 million with 76% of the budget coming from the state of California through the Metropolitan Transportation Commission, 19% coming from bridge tolls, and 5% of the money coming from federal funds. 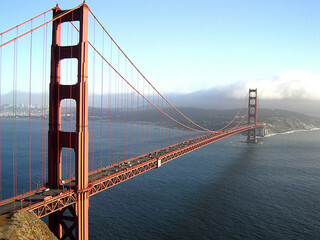 The Golden Gate Bridge’s MMB system will include about 11,538 feet of 12-inch wide, 32-inch high moveable barrier units. Each 39-inch long unit will weigh 1,500 lbs. Barrier units will be steel clad and filled with high density concrete. Two special barrier transfer machines, called “zipper trucks,” will be able to shift the 3,517 piece system to accommodate traffic patterns. In order to complete the installation of the MMB, the bridge will be closed for a 52 hour period spanning from Friday night to Monday morning and occurring sometime in late October or early November. According to the official website, the MMB will make the bridge safer by minimizing the risk of cross-over, head-on collisions. Although the site touts a low accident rate when compared with similar spans, it confirms that the bridge saw 306 collisions from 2006 to 2010, including 83 injuries. The most recent fatality due to a head-on crossover crash on the bridge occurred in 2001. A recent article in the San Francisco Chronicle goes into further detail, noting that 36 people died in accidents on the Golden Gate Bridge since 1970, with 16 of the fatalities involving cross-over collisions. While the accident rate on the bridge is low, many continue to believe that the current plastic border is inadequate and that a major tragedy could occur at any time. According to another Chronicle report, this one from December 2013, the bridge authorities acknowledged that a stronger median could have prevented, or at least reduced in severity, an accident that injured three and created traffic problems for hours. The article also mentioned Dr. Grace Dammann who was paralyzed following a head-on collision on the bridge in 2008. Accidents are scary and it is hard to imagine how much scarier it must be to be involved in an accident while suspended high over water or above another roadway. We hope the barrier project helps make travelling on the Golden Gate Bridge safer for both residents and visitors. Of course, safety also rests in the hands of every driver and crossing a bridge demands particular attention. If you have been injured in a car accident on a San Francisco bridge, or a span elsewhere in Northern California, and someone else is to blame, please call our office. Attorney Brod is a knowledgeable and experienced lawyer for San Francisco car accident victims and our team prides ourselves on providing high-quality legal services and being attentive to each and every one of our clients. A reminder — Personal injury suits help you recover vital monetary compensation and they also help remind the public that unsafe behavior will not be tolerated. Safety improvements can help keep us safe, but only when drivers share in the commitment to safety.